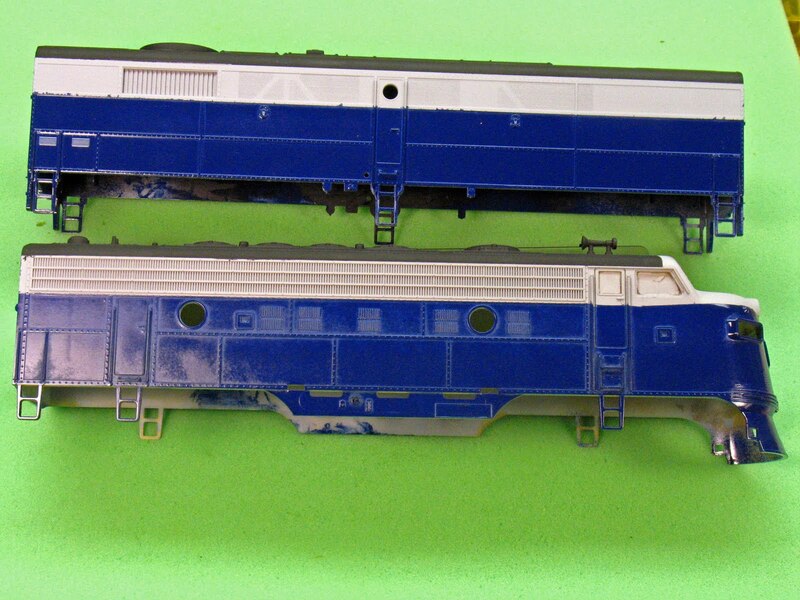 After being on my workbench for an embarrassingly long period of time, I am nearing completion of three diesel shells repainted into the B&O "Royal" Blue & Gray scheme. Only two of the shells are shown in this picture. The upper is a Weaver FB-2 and the lower is an Atlas (1970's) F9 (Yes, yes, I know that the B&O had no F9s; but I do and I'm using them until I can get and build some P&D or All Nation F7s. Besides I'd rather practice painting on these units instead of the better ones). Not shown is a Weaver FA-2 which, as of this date, still has only the black roof and the gray band. I've learned a lot in this, my first attempt to repaint a diesel since I was a sophomore in High School. Foremost among them is that there is no good model paint out there for either B&O Royal Blue or B&O Gray - regardless of the several model paints sold as B&O Royal Blue. I bought B&O Royal Blue in Scalecoat, Floquil Poly S and Badger Modelflex. Poly S has a definite purple tint, while Scalecoat and Modelflex are both too bright(with Scalecoat the darker by about a half shade). I reluctantly used the Scalecoat. By contrast, the picture below is an actual F7, restored to B&O colors; taken by me at a WV Rails 2010 on June 25. Notice that the blue is a shade or two closer to a Navy blue. It's the same for every picture that I can find on the web, the real locos are darker. Granted, the model is being photographed under 4000K fluorescents and the real loco is in sunlight; but that should make the real loco a brighter blue. It's possible that the model paint manufacturers have made some assumptions about the layout lighting that their paints will be viewed under and adjusted the color accordingly. In any event, I did not like the color of any available B&O Blue and I will try to formulate a mix of paints that will suit me better. I'll probably use the Modelfex as a base as it is a standard acrylic and can be mixed with the widest variety of other paints. Poly S is an acrylic too, but I would not know how to downplay it's purplish cast. For the moment, these locos are going into service as is. It's the same for B&O Gray, except that no model paint manufacturer sells a paint labeled B&O Gray. Most modelers use D&H Gray, but that appeared too dark to me. I had tried nearly every light gray that I could find (that's one of the reasons that this project took so long). I even tried many of the craft paint colors. You'd be surprised at how many color variations are present in gray paint when they are sprayed next to one another on a white card; they are not all gradations of neutral gray. Yellow and brown casts predominate. That's fine if you are painting rocks, but it's not B&O Gray. A knowledgeable B&O modeler suggested using Floquil primer as the gray color; which is what I did. It appears to be a half shade too light compared to all of the prototype photos that I can find. The next most important lesson learned is about masking. I followed conventional wisdom and painted from light to dark; in spite of the fact that I had read somewhere (I believe in B&O Modeler magazine) that dark to light is a better way to do this paint scheme. Whoever wrote this was right. Painting the gray first meant that I had to mask along the upper and lower rivet strips above and below the grills. Try as I might I could not get a perfect seal of the tape along the rivets. If you click on the pictures to enlarge them, you will see that the roof's black and the side's blue seeped under the masking tape onto the rivet strips. These will have to be touched-up. I think that a better way would be to paint the blue first without masking even if the paint strays onto the grill and/or the nose. Then casually masking off the sides to protect the blue, spray the roof black keeping the black off of the grills and the nose as much as possible but without having to do a perfect job. Finally do the critical masking for the gray. In this case the masking tape will be protecting the black above the top rivet strip and the blue below the lower rivet strip but it will not have to be applied to either rivet strip itself. As an added bonus, the masking for the shallow chevron of gray below the headlight on "A" units will also be easier to apply lying flat and flush on the nose and not applied over the headlight. The final lesson is about priming. The FB-2 was primed overall with Testor's gray primer and it has better paint adhesion and a darker, less transparent color of blue. The primer was used because the stripped shell was black plastic. Even though the F9 was completely stripped down to an almost white plastic the paint does not stick as well nor cover as well. I'll camouflage this flaw with weathering this time; but next time I prime before color coating. BTW Floquil primer (solvent based) is thinner and covers less detail than the Testors. Microscale decals will finish off the paint job. The Weavers will get DCC decoders and go directly into service. The Atlas will receive a new motor and decoder before entering service.